It used to be that finding a new dynamic packaging concept was something of a rarity and when a product’s packaging changed it was a significant event in the marketplace. Once a product made it to the shelf, it tended to remain there undisturbed almost without question – but no longer. Consumer packaged goods companies have moved into survival mode as they work to keep up with the rapidly changing consumer-driven market and the competition to get new products into the market. Products with legacy brand names are still on shelf but they have expanded beyond what used to be their quiet, comfortable niche to lay claim to new territory. Hershey’s, the iconic chocolate maker, made famous by chocolate bars and foil-covered “kisses” is expanding into the snack market, combining their candy-making legacy with healthier snacking ingredients. In expanding into new categories, Hershey’s has done an excellent job of creating a consistent, strong brand, keeping it at the forefront in communicating with their consumers. Consumers see the brand name and the Hershey’s brown package and they immediately associate any new products with the existing product family. However, an effective package is more than a strong brand presence. 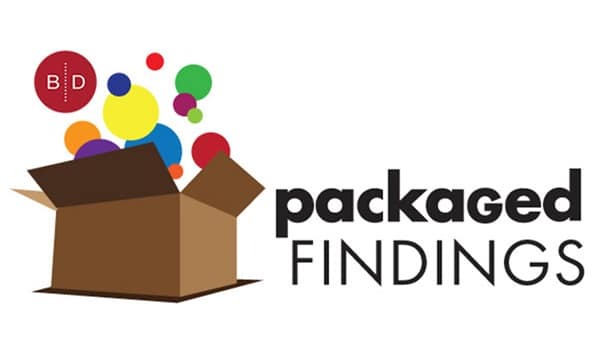 With rapidly increasing numbers of products on shelf to compete with, and less time and willingness for consumers to spend on making purchasing selections, it stands to reason that everything on your package has to work efficiently in order to make the connection with the consumer and form an impression about a new product. It has been said so many times and in so many ways, but it really does take just seconds for the human brain to respond to color and images, which is why they play a critically important role in packaging. As I was looking for party snacks, I found myself eying the Hershey’s packaging for Dipped Pretzels and Popped Snack Mix. To me, the snack mix package worked so much more effectively than the pretzel package, using a high contrast, eye-catching bright yellow band to emphasize the product form, immediately pulling awareness to the copy. Below the yellow band, assorted images featured the variety of elements contained in the mix. As a consumer, I didn’t need to read a thing to understand what was in the bag – but if I did, a small line of copy detailed the contents of the package – the rare example of a complete and concise face panel accomplished in three points. Then there was the pretzel package. The accent color was blue, which offered significantly less contrast against the Hershey’s brown, reducing the visual impact. The copy reversed out well like the snack mix but that was where things sort of fell apart. The product was chocolate covered pretzels, which should be an appealing visual. However, the dark chocolate product isolated against the brown bag became almost invisible in the sense that it took a fair amount of reading until I discovered the pretzels were dipped in milk chocolate with dark chocolate drizzles. The key benefit of using Snyder’s of Hanover pretzels was the last element I discovered, which to my thinking should have been included in the secondary communication identifying the product as Dipped Snyder’s Pretzels. Consumers are no longer as brand loyal as before and the contemporary consumer is influenced by so many competitive factors – packaging, especially for a new product has to stand out and close the sale at that final moment of contact. 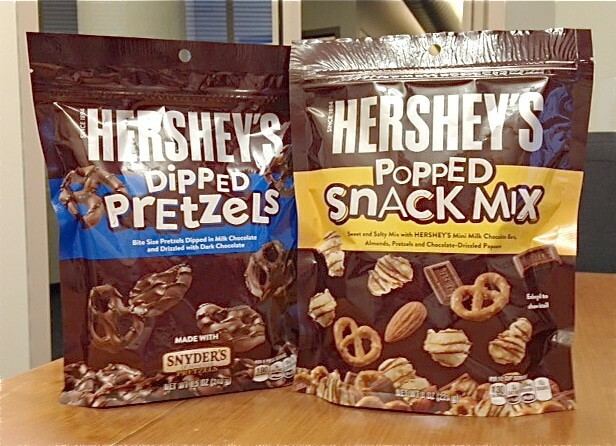 If a product is the package in the minds of the consumer, it would be worthwhile for Hershey’s to re-examine the pretzel snack package and make the few simple changes it needs to be as dynamic as the snack mix package. Make sure your new or expanding product line engages with the consumer, leaving the consumer with a clear understanding of your product and its benefits. Contact us at 920-886-7727 or info@brand-directions.com to find out how our seasoned design team can help you with package design that creates the right first impression.